Illinois can save thousands per inmate by expanding cost-effective alternatives to prison for nonviolent offenders. Fixing Illinois’ criminal-justice system means investing in what works, especially when it comes at a fraction of the cost of incarceration. 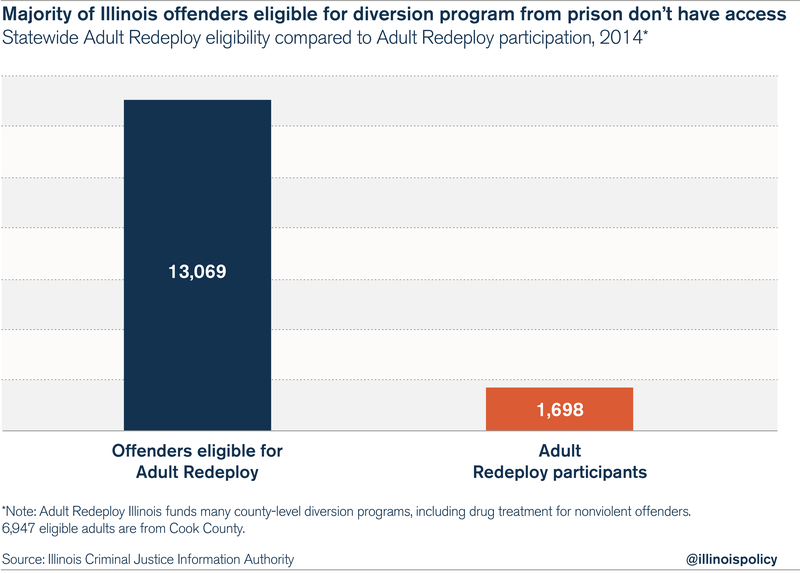 One area in which the state has plenty of room to improve is increasing access to alternative programs such as Adult Redeploy Illinois, or ARI. ARI provides funding incentives for counties to create alternative programs, such as substance-abuse treatment, under which nonviolent offenders can receive targeted care instead of going to state prison. As of September 2015, ARI has saved Illinois an estimated $63.9 million by diverting nonviolent offenders from incarceration. Substance dependence poses serious challenges to Illinois’ criminal-justice system. Changing how Illinois deals with drug addicts – by diverting them to alternative programs instead of defaulting to incarceration – increases the likelihood that these offenders will stay out of the criminal-justice system. Data from the Illinois Criminal Justice Information Authority, or ICJIA, show that the evidence-based practices used in ARI’s programs can reduce recidivism rates by up to 20 percent. Each diversion program costs an average of $4,400 per participant each year, compared to the $22,000 per person it costs to keep someone in prison. As of September 2015, ARI has saved Illinois an estimated $63.9 million by diverting nonviolent offenders away from prison to alternative programs. Despite ARI’s success, there are still unmet diversion needs. According to data from the ICJIA, over 13,000 offenders appeared eligible for ARI programs in 2014. But just 1,698 people were in ARI-funded programs that year. This means many nonviolent offenders pass through the criminal-justice system even though their cases could be better addressed through diversion and treatment programs. Why is there such a large unmet need? Lack of capacity explains this in part. The county-level diversion programs that exist today can only handle so many people. For example, in Cook County’s Access to Treatment Court, or ACT, a successful substance-abuse treatment program, the target population for a 9-month grant in 2013 was 203 individuals. But the data show that in Cook County, 6,947 offenders could have been eligible for ARI programs in 2014. Although Cook County has at least one other ARI program in addition to the ATC, there are not enough to accommodate all of the county’s eligible offenders. Making the state’s criminal-justice system more cost-effective means investing in what works. ARI programs cost just 20 percent of the amount required for incarceration; Illinois could reinvest those savings and expand this kind of programming. If Illinois is to reduce its prison population 25 percent by 2025, as Gov. Bruce Rauner has advocated, in addition to sentencing and re-entry reform, the state must determine how to effectively scale up community-based alternatives to prison for nonviolent offenders.